Following a NASCAR pileup that sent driver Austin Dillon scaling the catch fence as his car shred behind him last year, a fan allegedly injured in the incident filed a lawsuit against both the track and NASCAR. The fan alleges that debris hit him in the head and shoulder, and that he has yet to fully recover. William Fulton filed the lawsuit in a Florida state court in Volusia County on Monday, according to ESPN. 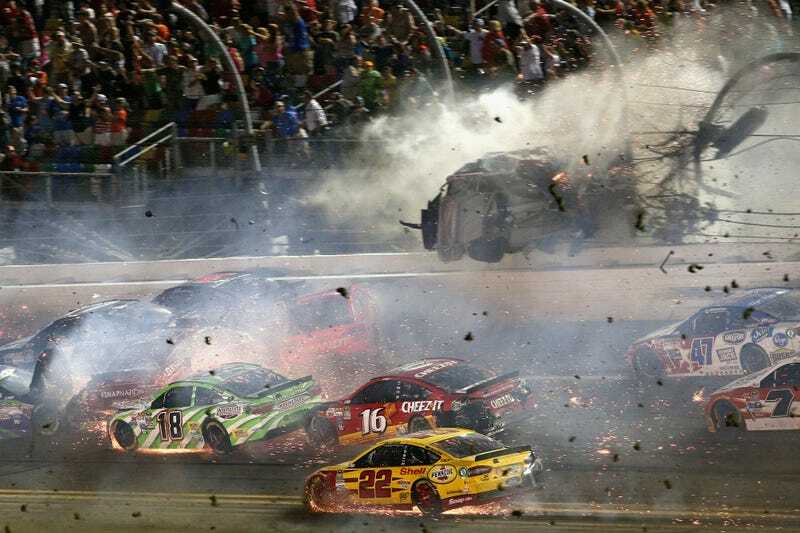 Fulton claims that he was in the sixth row when the crash occurred at the checkered flag in the Coke Zero 400 last July. In addition to leaving out specific injuries, the complaint did not state the amount being sought by Fulton in damages. Neither NASCAR nor the parent company of Daytona International Speedway, the International Speedway Corporation, had comment on the matter, according to ESPN. Fulton’s attorney declined comment. According to ESPN, the standard sanctioning agreement for NASCAR means tracks must assume liability for spectator injuries and have $50 million in liability insurance. The report added that NASCAR has been researching new catch-fence technologies, but it’s a tough balance—the fences need to be strong enough to separate cars from spectators, yet transparent enough for visibility. But, with wrecks like Dillon’s and the one that Kyle Larson had at the same race track in 2013, the matter continues to weigh on the sport.